South Africa coach Heyneke Meyer has recalled Bismarck du Plessis as one of five changes to the Springboks' starting side to play Australia in the Nelson Mandela Challenge Plate Test at Suncorp Stadium in Brisbane on Saturday. Du Plessis has finally regained full fitness after he sustained a knee injury against Argentina last year, and he will start alongside his brother Jannie in a front-row designed to hammer the Wallabies at scrum time. Flip van der Merwe, like du Plessis, is promoted from the bench to replace Juandre Kruger in the second-row, while Zane Kirchner will play his first Test of the year at fullback after recovering from a hand injury. Meyer made two positional changes to clear the way for Kirchner's return, moving Willie le Roux from fullback to right wing and Bryan Habana, who scored a hat-trick against Australia in Pretoria last year, shifting to the left flank. Adriaan Strauss and Kruger have dropped to the bench to make room for du Plessis and van der Merwe, while winger Bjorn Basson drops out of the matchday squad altogether after starting in the two wins over Argentina with which South Africa opened their campaign. "A few of these changes are purely rotational in order to give guys with fresh legs a go, while others are simply a case of horses for courses," Meyer said. "We're fortunate to be in a position to rotate players of the calibre of Bismarck and Adriaan, while we felt this was the right opportunity to give Flip and Zane a go in the starting team. In the end, the most important factor still remains consistency in selection. In our squad, any player can slot in at any stage, and that is a good position to be in." The Springboks have never won in seven Tests at Suncorp Stadiunm, including six since the inception of the Tri-Nations/Rugby Championship in 1996, but Meyer has previously shrugged off the dismal record saying "it just means more of a challenge and brings more motivation and makes you more excited". 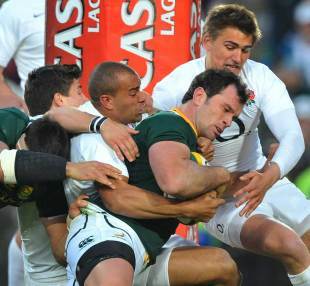 "It's always very tough against the Wallabies," Meyer said. "They have got a lot of skilful players in the forwards and the backs. And their forwards can play like backs. They're the type of side if they get going and get quick ball, they are very dangerous to play." Springboks: Zane Kirchner; Willie le Roux, JJ Engelbrecht, Jean de Villiers (captain), Bryan Habana; Morne Steyn, Ruan Pienaar; Duane Vermeulen, Willem Alberts, Francois Louw; Flip van der Merwe, Eben Etzebeth; Jannie du Plessis, Bismarck du Plessis, 1-Tendai Mtawarira. Replacements: Adriaan Strauss, Gurthro Steenkamp, Coenie Oosthuizen, Juandre Kruger, Siya Kolisi, Jano Vermaak, Pat Lambie, Jan Serfontein.